Since the Turkish Law No. 5651 on the Regulation of Publications on the Internet and Suppression of Crimes Committed by means of Such Publications came into force in November 2007, several websites were blocked by court orders and administrative blocking orders issued by the Telecommunications Communication Presidency (TIB). In terms of statistics, it was revealed by TIB that as of 01 December, 2008, 1310 websites are blocked in Turkey (compared to 1187 on 01 November, 2008, and compared to 1115 on 01 October, 2008) under the provisions of Law No. 5651. 271 (21%) of these websites are blocked by court orders, while majority, 1039 (79%) are blocked via administrative blocking orders issued by TIB. In terms of the 271 court orders so far, 38 websites were blocked because they were deemed obscene (article 226 of the Turkish Penal Code), 5 websites were blocked because they involved sexual exploitation and abuse of children (article 103(1) of the Turkish Penal Code), 17 websites were blocked because of gambling (article 228 of the Turkish Penal Code), 3 were blocked because they involved betting, and 50 websites were ordered to be blocked in relation to crimes committed against Atatürk (Law No. 5816, dated 25/7/1951). 32 of these 49 blocking orders were recurring orders involving 17 websites (majority involved YouTube) issued by different courts around the country. With regards to 158 illegal items containing crimes committed against Atatürk TIB successfully asked content and hosting providers to take down these items from their servers. As a result of such co-operation their websites were not subjected to access blocking orders. Furthermore, 2 websites were blocked in relation to prostitution (article 227, Turkish Criminal Code), and one website was ordered to be blocked in relation to the facilitation of the use of drugs (article 190 of the Turkish Penal Code). 155 websites were blocked by courts for reasons outside the scope of Law No. 5651 but the detailed breakdown for these orders was not provided by TIB. It is however understood that TIB executed the blocking orders even though they do not involve the catalogue crimes listed in article 8. 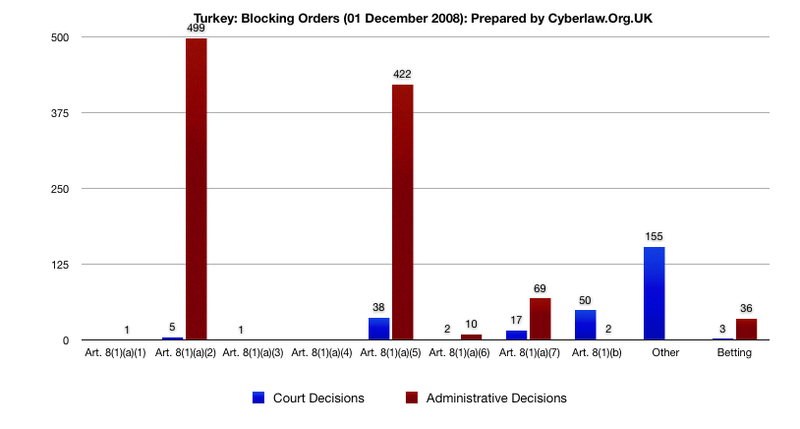 In terms of the 1039 administrative blocking orders issued by TIB, the majority, with 499 blocking orders issued as of 01 December, 2008 involved sexual exploitation and abuse of children (article 103(1) of the Turkish Penal Code), 422 involved obscenity (article 226 of the Turkish Penal Code), 69 involved gambling sites (article 228 of the Turkish Penal Code), 36 involved football and other sports betting websites (Law No. 5728, article 256), 10 involved prostitution websites (article 227 of the Turkish Penal Code), 2 involved crimes committed against Atatürk (Law No. 5816, dated 25/7/1951), and one involved encouragement and incitement of suicide (article 84 of the Turkish Penal Code). Article 8(1)(a)(1): encouragement and incitement of suicide (article 84 of the Turkish Penal Code); article 8(1)(a)(2): sexual exploitation and abuse of children (article 103(1) of the Turkish Penal Code); article 8(1)(a)(3): facilitation of the use of drugs (article 190 of the Turkish Penal Code); article 8(1)(a)(4): provision of dangerous substances for health (article 194 of the Turkish Penal Code); article 8(1)(a)(5): obscenity (article 226 of the Turkish Penal Code); article 8(1)(a)(6): prostitution (article 227 of the Turkish Penal Code); article 8(1)(a)(7): gambling (article 228 of the Turkish Penal Code); article 8(1)(b): crimes committed against Atatürk (Law No. 5816, dated 25/7/1951); and football and other sports betting (Law No. 5728, article 256). A detailed assessment of the Turkish approaches to Internet content regulation is provided in a 100 page long report entitled Restricted Access: A Critical Assessment of Internet Content Regulation and Censorship in Turkey written by Dr. Yaman Akdeniz and Dr. Kerem Altiparmak. This bi-lingual (English/Turkish) report was published during November 2008. Be the first to comment on "Turkish Website Blocking Statistics as of 01 December 2008"